September 28, 2015|Posted in: Happy, Healthy, Smart Kids! 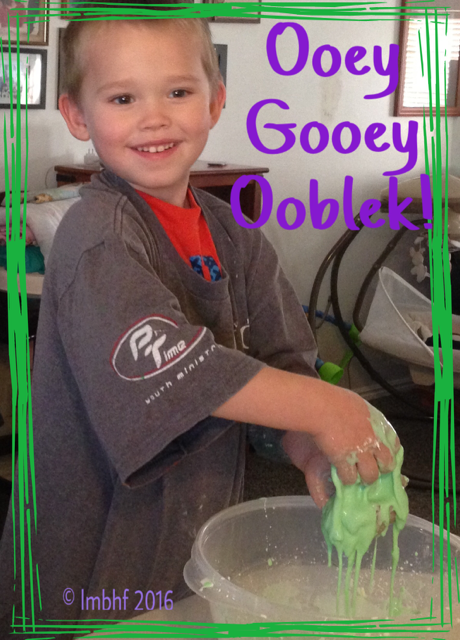 This ooey gooey ooblek will keep kids of all ages busy for hours! Toddlers and teenagers alike (not to mention adults) find this stuff fascinating! So if you want to keep the kids occupied while you get things done mix up a batch and let them dig in. On second thought, you’ll probably just end up as enthralled as they kids so you might want to save this activity for a time when you can dig in and play with the kids yourself. Mix the cornstarch, water and food coloring together in a bowl, using a spoon. Your Ooblek is ready to be played with. Scoop it and squeeze it, make a ball and then let it run through your fingers! Ooblek isn’t good for your drains so when you’re all done dispose of it in the garbage. Ooblek is a suspension or a non-Newtonian liquid (kind of like quick sand). That means it does not have the typical properties of either a liquid or a solid. The cornstarch’s long rope shaped molecules are large enough that if left alone, they will eventually settle out of the water. When mixed together, if you apply slight pressure or movement, the ooblek will flow like a liquid. When you apply greater force by squeezing it or rolling it in your hands the long cornstarch molecules are squeezed together, trapping the water and that makes the Ooblek behave more like a solid.